Join inspiring yoga instructor Tilak Pyle as he leads a purifying vinyasa flow series straight into the heart of yoga. In this video Tilak captures the transforming power of this ancient practice by challenging your body and encouraging you to listen, explore, play, and surrender. Filmed at five breathtaking locations in the Blue Ridge Mountains with a soulful soundtrack including Krishna Das, Dave Stringer, Andy Waldeck, Scott Mills, and Jai Uttal! I was in love with this practice from the first time I tried it, and I suspect that most yoga students who share my level (intermediate) and preferences (slowly flowing yoga with lots of hip openers and twists but few backbends) will also share my opinion here. Instructor Tilak Pyle has studied under Erich Schiffmann, and it shows, as this video has a very similar feel to Schiffmann's classic Yoga Mind and Body. The video was filmed in the Blue Ridge Mountains, with Tilak and his four assistants each appearing in a different outdoor location. The scenery is gorgeous and worth a watch of the video on its own, as you are likely to miss much while actually doing the practice. The music, which includes selections by Krishna Das and Jai Uttal, is also beautiful and lends a soulful element to the practice. The entire practice is about 85 minutes long, but it is chaptered and can be broken into shorter segments (see below).As a nice change of pace to most other yoga videos, Altar begins in a seated position, starting with a brief meditation and moving into simple seated forward bends. You then come to standing, but instead of going right into sun salutations, Tilak leads you through several balance postures (tree, eagle) as well as half sun salutes. Following this is a flowing lunge series which includes a moving "liquid" lunge and low lunge with forearms on the floor (lizard pose). The first standing series consists of warrior 1, 2, triangle, and side angle; short vinyasas are performed between each series, but not between every posture. After plank/side plank, there is a second standing series focused more on balance postures: pyramid, warrior 3, and half moon. Next, you'll move into dog pose, open your hips, and then continue with pigeon. This is followed by a short child's pose series which includes several shoulder stretches and then a brief savasana. Since this is about the 45 minute mark, if you don't have time for the entire practice, you can stop here, but you probably won't want to!The second half of the practice begins with a spread leg standing adductor stretch and then moves into standing wide-legged forward bend. Next you'll lie on your back for reclined leg stretches, including hand to foot and thread the needle. From a seated position, you'll perform rock the baby and a forward fold with cat/dog tilt. Next comes headstand, which Tilak and company perform unsupported, but there is enough setup time to use a wall. Headstand is held for several breaths, and then another child's pose and a brief pause follow. The final segment of the practice begins with seated forward bends and moves into shoulderstand, lying and seated twists, yoga mudra, and finally, relaxation pose. The asana practice ends here (75 minutes), but Tilak allows an additional 10 minutes for a long savasana, pranayama (alternate nostril breathing and retention), and final meditation. Bonuses on this video include a detailed asana list, offered in both Sanskrit and English, and "deleted scenes" (bloopers). Don't miss this last section: Tilak and crew are hilarious as they struggle with uneven surfaces, wind, bugs, external noise, and the like. Throughout the practice, Tilak is a soothing, calming presence. He cues poses in both Sanskrit and English, and his voiceover guidance is excellent (only occasionally moving slightly out of sync with the screen). While his instruction is not overly detailed (this is an intermediate practice, after all), he does provide very helpful form pointers. Overall, this is a beautiful, well-done practice and highly recommended as a must-have addition to your yoga media collection. 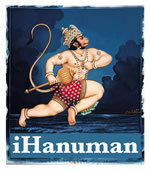 Tilak Pyle is the Co-Founder of iHanuman and Producer of Altar of the Heart.